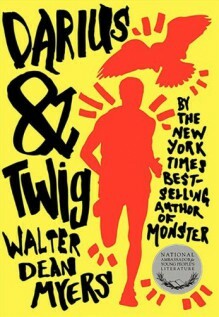 New York Times bestselling author and Printz Award winner Walter Dean Myers once again connects with teenagers everywhere in Darius & Twig, a novel about friendship and needing to live your own dream.Darius and Twig are an unlikely pair: Darius is a writer whose only escape is his alter ego, a peregrine falcon named Fury, and Twig is a middle-distance runner striving for athletic success. But they are drawn together in the struggle to overcome the obstacles that Harlem life throws at them.The two friends must face down bullies, an abusive uncle, and the idea that they’ll be stuck in the same place forever in this touching and raw new teen novel from Walter Dean Myers, award-winning author of Monster, Kick, We Are America, Bad Boy, and many other celebrated literary works for children and teens. http://Sandy.booklikes.com My Never Ending List 3.5 A short read with a powerful message. text A short read with a powerful message.